I received this from the author in return for an honest review. I’d read book one and loved it ( Spell Struck) so was looking forward to more from Rian and Co. This book picks up several years after the first, Rian and Cato are having one of what seem to be fairly regular spats and we don’t see so much of them. I thought I’d miss them but there’s enough to keep me happy and I just loved the new focus on a grown up Rhodry and Marco and Rian’s long time friend Elise. Elise has come to stay after big problems in her career and personal life caused by the betrayal of her lover. She’s feeling vulnerable and in need of some rest and care – but she’s come to the wrong place! Witnessing the end of what seems to be an act of vandalism she mentions it to Rhodry as there were anti witch slogans daubed on the wall. Rhodry works for Rian at her detective agency, Wright Noble and Trew. ( what a mane 🙂 love it). Turns out that the vandalism is a bit more, one of the buildings owners disappears and the kidnappers seem to think Elise knows more than she does plunging into what seems an endless spiral of danger…along the way she becomes very close to Rhodry, though she worries about the age difference at first then finds that maybe his relationship to Marco could be a greater problem. The police are very unhelpful to the point where they are obstructing the agency’s enquiries placing Elise in more danger. Its once again a riveting read, a romance with a twist (i’m not saying more but that scene after Elise has showered…hot!) and plenty of action. Nicole is spot on with editing and plot lines that flow seamlessly together – I’m always amazed at how tiny hints earlier in the story turn out to be major parts of a later plot . The trick is to look for them. This is one of those books – like the first- that has so much detail it bears reading over and over and will go into my favourites collection. 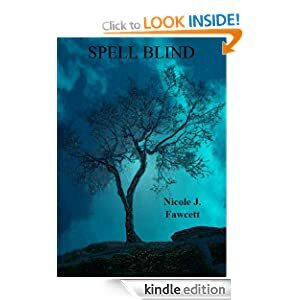 If you love romance, a great adventurous storyline, witches vampires and fae (though they fae aren’t much in evidence here ) then you’ll love this book. Its fantasy and romance for the thinking reader – not one where you’re spoon fed each plot but one where you have to think and wonder whatever is coming next 🙂 Right up my street.